You are home with your kids, or at one and once again you are hit with the worst headache ever. Not only is it hard to focus, but it is uncomfortable. There are many essential oils that will help relieve headaches, so if you get headaches often, then you know exactly what I am talking about. Migraines? A whole other story. Today, I will share with you some reasons you may be getting headaches, and what you can do to stop them, or at least get relief from them when they show up. These headaches show up as mild-to-moderate pain in your head that’s often described as feeling like a tight band around your head. A tension headache is the most common type of headache, yet its’ causes aren’t well-understood. These type of headaches occur in cyclical patterns or clusters and are one of the most painful types of headaches. A cluster headache commonly awakens you in the middle of the night with intense pain in or around one eye, on one side of your head. Fortunately, cluster headache is rare and not life-threatening. Treatments can make cluster headache attacks shorter and less severe. Are mostly caused by an infection and inflammation of the nasal passages that leads to congestion; which causes pain and pressure in the forehead and behind the cheekbones. A patient suffering from headaches as many days as not is said to have chronic headaches. If you have headaches for at least 15 days per month, then you have chronic daily headaches (CDH). Headaches are triggered by a variety of things. The most common cause of headaches is stress. Stress causes what is called a tension headache, when the muscles in your scalp, neck, and face tighten and contract, causing spasms and pain. Did you know that headaches are one of the most common medical complaints? I am not a doctor, nor am I a health physician, but as headaches can be a symptom of a serious condition, it is important to seek medical advice if they become more severe, regular, or persistent. If you’re experiencing a huge amount of stress, anxiety or depression, you are more likely to experience headaches. Lack of a good night’s sleep influences the frequency and severity of your headache. Essential oils have been a blessing for someone like me who has frequent headaches. They can be life-changing if you are in constant pain. Essential oils are not a new fad. In fact, they have been utilized since ancient times in various cultures, especially in Egypt (Sakkara), India, China, and Southern Europe. Essential oils are a concentrated liquid extracted from a plant. Aromatherapists believe that each essential oil offers a different set of health benefits. I personally do not like to rely on medication and prefer the benefits of natural products without the long list of side effects that can accompany swallowing pills. If you are the same, here are the top five essential oils I know will help you. I cannot praise peppermint oil enough. It works best for me which is why I listed it here are a my NUMBER ONE favourite essential oil of all time. It contains menthol, which can help muscles relax and ease the pain. Peppermint also has a calming effect on the body as well as the brain. Peppermint helps with blood flow which can ease pains in your head and neck area. When you use this as one of the essential oils that will help relieve headaches, you can dilute the peppermint with another carrier oil, like coconut oil, and apply to temples. I’ll explain more about carrier oils before the end of this post. How You Can Use It: Place 2-3 undiluted drops on your fingertips and rub on your temples, across your forehead, wrists or neck. I love lavender essential oils because they are best used for stress, anxiety relief and relaxation. Lavender is often used to help people get to sleep as well as treat headaches and migraines. When I place 3 drops on of lavender on my chest, before I go to bed, I am usually asleep within 10 minutes. Without lavender, I am awake for up to 3 hours after getting into bed. Breathing in the scent from lavender essential oil is great for helping your body to relax. My best friend always experiences a reduction in pain within 20 minutes of inhaling lavender oil. Just try it and see. How You Can Use It: Diffuse five drops of lavender oil at home or in the office. Or apply lavender oil topically to the back of your neck, temples and wrists. 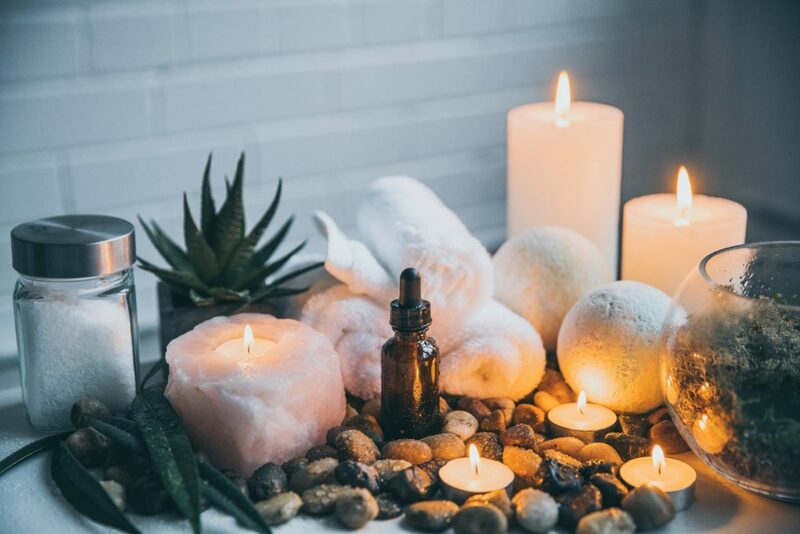 To relax your body and mind, add five to 10 drops of lavender oil to a warm-water bath and take deep breaths so the sedative properties begin to take effect and reduce headache tension. Eucalyptus is great because it works as an expectorant. This means it helps cleanse the body of toxins and harmful microorganisms. while promoting emotional balance and boosting mood. If you have sinus issues and most of your headaches are caused by it, then eucalyptus essential oils can become your new best friend. This oil will open up the nasal passages, clear the sinuses, and can help relieve sinus tension that causes the headaches. Here’s How To Use It: Dilute two to four drops of eucalyptus oil with a carrier oil, and apply it to your chest, back of the neck, temples and forehead. Apply it to your chest to help clear your sinuses. Add a few drops to hot water and breathe in the vapour. I love this essential oil for its’ amazing calming effect and improves personal orientation and alertness. Rosemary oil also reduces stress and emotional triggers that can cause headaches .It also has powerful anti-inflammatory and pain killing properties and has widely been used in folk medicine for hundreds of years for improved circulation, stress reduction of stress, and pain relief. Best Ways To Use It: Take one drop of rosemary oil internally by adding it to tea, water or soup when experiencing headache or migraine attacks. To reduce headache pain, mix two drops of rosemary oil with two drops of peppermint oil and one teaspoon of coconut oil, and rub it into the temples, forehead and back of your neck. The essential oil of chamomile relaxes the body and soothes muscles, and for this reason can be a great aid in treating tension headaches. It can also help treat anxiety and insomnia, which are common causes of headaches. How You Can Use It: You can add a few drops of chamomile essential oil diluted in a carrier oil to a bath, or to hot water, and breathe in the steam. When using these essential oils for headaches, especially in sensitive areas like the nose and forehead, it’s best to dilute the oil first. Essential oils that will help relieve headaches are regarded as safe, and have fewer side effects compared to most traditional migraine and headache medications. Applying oils to the skin can cause irritation, including a stinging, burning feeling, redness, or a rash. As great as they are, essential oils can cause allergic reactions. If you have never used an oil before, do a quick patch test on a small area of skin before applying to larger areas. Dilute your essential oils with a carrier oil before applying to the skin. To prevent widespread irritation, do a small test spot on your skin before applying a large amount. If there is no reaction in 24 to 48 hours, you should be fine. If you use these oils internally, remember that less is more. Do not use for more than 21 days without taking a week off from internal use. Carrier oils are mainly oils extracted from the nuts, seeds or kernels of plants. They compliment essential oils and are great for diluting essential oils for skin and hair products such as massage oils, body scrubs, lotions, and balms. Carrier oils are perfect for essential oils as they retain and carry all the medicinal properties of essential oils. You can choose the concentration levels by deciding the ratio of each essential oil to carrier oil. They don’t evaporate or exude a strong aroma but carry their own amazing therapeutic properties. Carrier oils should always be bought cold-pressed, 100% pure, and organic, unprocessed oils. The top five essential oils for headaches are peppermint, lavender, eucalyptus rosemary and chamomile oil. The best way to use essential oils that help relieve headaches is by diffusing them with a high-quality diffuser to soothe headaches. I do not recommend essential oils for infants under 3 years old, pregnant women, or breast feeding moms. Lavender and rosemary oils, in particular, can be dangerous. If you have preexisting conditions like asthma or heart problems, or any other ailment for that matter, speak to your doctor before using any essential oils. This is to make sure they won’t aggravate any existing health problems. Purchase your essential oils from a reputable company. Always do your research. Taking a bath can help decrease headache intensity. Add a few drops of your chosen essential oil like peppermint, lavender or eucalyptus to your bath. Pour some hot water into a bowl and add 5 to 7 drops of essential oil to it. Cover your head with a towel, close your eyes, and breathe through your nose. You only need to do this for two to three minutes. Steam inhalation also helps with congestion. Essential oils need to be diluted in a carrier oil before being applied directly to the skin. Usually, the recommended ratio is 3 to 5 drops of essential oil to 1 ounce of sweet almond oil, warmed coconut oil, or mineral oil. Those with nut allergies should always avoid nut-based oils. Before applying any essential oil, do an allergy test. Mix 3 to 5 drops of essential oil with 1 ounce of your favourite carrier oil. Apply the mixture to the skin of your forearm. If there is no reaction within 24 to 48 hours, the essential oil should be safe to use. Research also shows that a 30-minute massage can help relieve headache symptoms within 24 hours. To make a homemade massage oil, add a few drops of peppermint oil to an ounce of a carrier oil. Use a diffuser to help diffuse the oil into the air. You can also inhale peppermint oil directly from the bottle. If the scent is too strong, add a few drops to a cloth, cotton ball, or tissue and breathe it in. Avoid incense sticks, as the smell of smoke, may worsen your symptoms. Essential oils are a more effective and safer alternative to pain relief medication. Essential oils provide relief, aid circulation and reduce stress in a natural way. They also have a ton of other health benefits and boost your immune system instead of wreaking havoc on your vital organs. Really, there are few safer, more beneficial ways to soothe headaches than by using essential oils for headaches. It should come as no surprise considering aromatherapy has long been used to treat pain and headaches. Essential oils can have numerous medicinal benefits when used correctly and can help to relieve headaches and migraines. When it comes to essential oils, remember that a little goes a long way. If you cannot see your doctor, go to the emergency room or call 911. There are so many other symptoms I could list here, you know your body, so go to the doctor or emergency room if you feel off. This information above has been provided with the best intentions possible. It is the responsibility of the user to seek professional medical advice from a doctor or midwife. There is no fixed recipe when it comes to using carrier oils and essential oils that will help relieve headaches. What might work for you might not work for someone else. Experiment with a variety of essential oils and carrier oils, pay attention to your body’s reaction, and find what work most optimally for you. Are you prone to getting headaches? Do you use essential oils? How do you handle the pain? Oh my, where was this post last week when I was suffering the worst tension and tiredness headaches?? Definitely saving for the day they return. I love essential oils and learning about each. What a great post. I have lavender but I’ll be sure to pick up rosemary and eucalyptus as well! I have been told to try essential oils for my arthritis, can you recommend any for swelling? I’ve never heard of this Essential Oils before, but it sounds like something I would use regularly due to the wonderful ingredients.I’ll definitely have to check it out now. Thanks so much for the review! I suffer from a lot of headaches and migraines. I’ve tried lavender oil for other things, but didn’t realize it could relieve my headaches also! Also, I’m definitely going to get a jump on using peppermint oil given all the positive impacts from it! I like to have essential oil when I am taking a bath and glad to learn few type here and my favorite would be still lavender as it help me with relaxation and promote my sleep better at night. I have great success with using the Peppermint oil when I have a headache. It really helps, almost immediately for me. I have never been tried to use any essential oil to relieve my headache and it sounds like a great idea instead of taking a medicine. I love oils too! Headaches are horrid, I remember when I had quite often and it was a nightmare. I am so happy it’s not like that any longer. I could really do with this right now. I have been getting a lot of headaches and nothing is helping yet. Peppermint oil has changed my life. Seriously, just a dab on my neck and my migraines get so much better! I use my peppermint oil for my migraines all the time. I keep several bottles in different places. It’s a lifesaver! Essentials oils are really amazing. I use them in my food and to keep up with my immune system. Thank you so much for sharing this! I get a lot of headaches, and I HATE taking pills. If i can relieve them naturally, I’m all over it.